The prototype of this single-seat all-metal fighter flew for the first time in December 1937. The first production version was the F2A-1 powered by a 700.4kW Wright R-1820-34 radial engine which went into service with the US Navy in 1939. From the initial order of 54, only 11 were actually accepted into service with US forces. The eleven were operated by the US Navy on board USS Saratoga and 44 were exported to Finland. 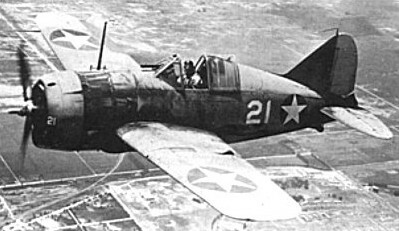 The F2A-1 was the US Navy's first monoplane fighter. These were followed by 43 894kW R-1820-40-engined F2A-2 and 108 F2A-3 for the US Navy. Addition of armour plate on the F2A-2 version reduced any performance advantage the basic Buffalo may have had over Japanese fighters. A contract was placed by the RAF in 1939 for 170 Brewster Model 339’s (called Buffalos) to be operated as a land fighter. Meanwhile a few fighters had reached Belgium and others were in service in the Netherlands East Indies and with the RAF. Finland bought 44 Brewster 239 from USA 1939-1940. Basically 43 Brewsters were on sale (US Navy order was 54 and only 11 was delivered). But Finland bought 44 and 38 came from US Navy order and six from Belgium order. Since Belgium has ordered Brewster 339, the factory had to make rather big modification to front fuselage. 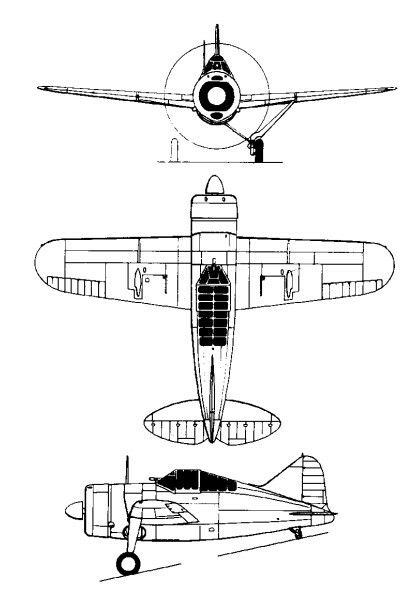 Apart from the Finnish fighters which fought well against the Russians, F2A were used almost exclusively against the Japanese and in all cases met superior aircraft. Heavy British losses in the Far East led to their withdrawal and US Navy action during the Battle of Midway was equally unsuccessful as 13 out of the 19 available Buffalos were lost to enemy fire. In an attempt to improve performance against the Japanese Zero, the .50 in mgs were replaced by .303s and the number of rounds reduced to 350. The fuel was restricted to 80 gallons. A total of more than 500 F2A were built. The Finns liked the Buffalo enough to design a version called the Humu ('Reckless') with a wooden wing and a Russian engine. It proved unsatisfactory in trials and only a single example was built. The one Brewster 239 (F2A-1) is in The Aviation Museum of Central Finland inb Tikkakoski, Finland. There is also the prototype of VL Humu which is the clone of F2A-1 or 239. Armament: 4x cal.50 MG (12,7mm), 2x 45kg Bomb.